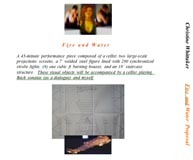 Fire and Water is based historically in Italian Opera, it has all of the aspects of the difficulties of love as well as the power. Fire and Water was originally designed and built between 1990 and 1993 and stored the script was finished in 2004 while an Athena Fellow with Mark Di Suvero. The multimedia details of the piece had to be reconfigured from analogue to a digital platform as well I have been revising the poetic verse. The final version may include an element of interactivity that will alter all of the visuals live. 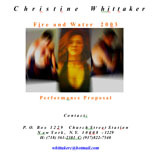 I'm now looking for the opportunity to perform Fire and Water. Silverman was a collaborative project between Greg Whittaker and I. Performed and staged in NYC on 42nd. st and Texas. The NYC performance occurred on 42nd. st, Rockefeller Center and in Soho on September 1, 1999. The 42nd street performance was covered in the media. Silverman is purely resonant of the contemporary culture’s fascination with branding, fame and the digital environment; Silverman was an iconic statement for the new millennium. Both performances had a video and photo component. Photo negatives took shape in the toy byproduct pictured. New York, NY 42 st. Times Sq. “Walking on broken glass/Choice” was a 45 min. performance composed of 3 performers, 2 video monitors, a video reel with a multiplicity of abstract and layered nuclear imagery the audio was a computer generated sound that emulated a heart beat. Lisa Crews sat in a steel chair (crucifix designed) inside the 6’ H x 6’ W x 6” D box, which contained 1,000 lbs. of broken safety glass. I encircled and wrapped her. later the red performer used 3’ shears to mimic the heartbeat sound. about "Walking on Broken Glass"
“One” was 2-part performance using 3 miles of a U of D campus the first 45 min. incorporating the audience as we crossed paths the 2 assistant performers marked maps of our location as per my hands were tied to theirs. The second part was site specific utilizing an open stringed back piano, 20 steel balls, 2 short wave radios, 1 large suspended frame, a sensor, canvas and paint. I would go from one side playing the string-backed piano the opposite side to paint an abstraction. The performance culminated when the canvas was finished.